WWE Elite Collection Series 2 Action Figure – captures all the action and dramatic exhibition of WWE SmackDown sports entertainment! This WWE Elite Collection features superbly sculpted 6-inch figures of the WWE’s biggest Superstars. These WWE action figures features deluxe articulation, amazing detail and accessories such as masks, armbands or costumes. Batista (a five-time world heavyweight champion) and Triple H (a thirteen-time World Champion) are sure to add excitement to your collection. Collect all of the WWE® Elite Collection Series 2 Action Figures to create your very own Monday Night Raw vs. Friday Night SmackDown wrestling tournaments! 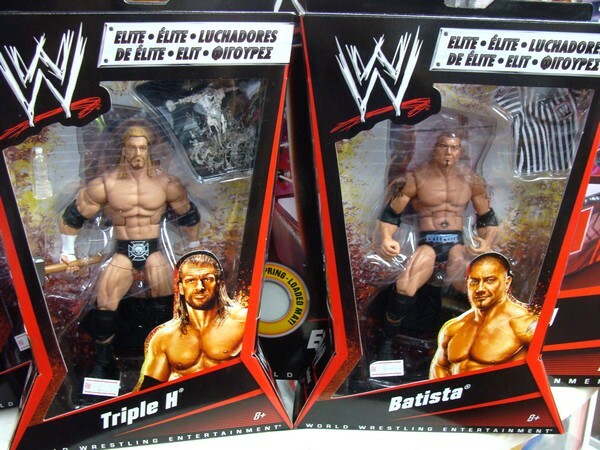 This WWE Elite Collection Series 2 is a must have for WWE® fans and collectors! Now available at Toywiz Malaysia and selling RM89 each.